I asked my mother many times why she chose Herta as her primary name and I never believed her answer: she liked it best. With my own sensitivity to names, I thought she had chosen the least attractive, but in hindsight, I realize it was the German one of the set. It’s hard for us to understand those cultural dynamics before and after the first World War. Although Latvian nationalism was high with their declaration of independence on November 17, 1917, there were still large numbers of Germans who remained in the country. They were very much the upper class with privileges, vestiges of nobility, estates, great wealth, and power. My mother’s mother, Wilhemina, was one of four sisters who had grown up on a German Manor in Lithuania at a time when such nobility was breaking up and Russians were entering territories to make their claims to the lands and the peoples. 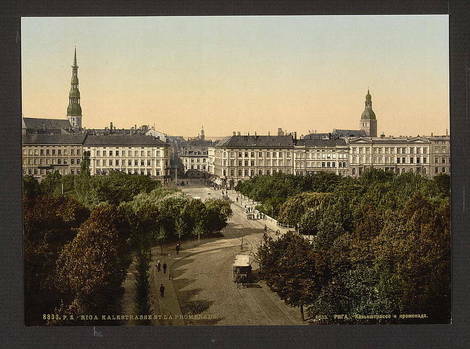 The sisters left and headed for the New York City of their region: Riga. And it was here that Wilhemina stayed, married a Latvian barber, and bore a child. But her goal was that her daughter would have more than she had: a better education, a future, a chance to make something more of her life. And so, in her mind, it was smarter to enroll her daughter in a German school, not a Latvian one, to embrace the power of the Baltic Germans and their influence and to meet “better” people. As a result, my mother was raised in a dual culture, with one foot in Latvia and another in German history, traditions, and attitude. She was ambitious as a youngster and although they were poor as mice, living all together in one room, she, her younger brother Harry, her mother Wilhemina and her father, Paul. The men shared one bed and the women the other. She had only one dress and one pair of shoes and her black stockings were many times repaired. And yet, she went to the German school and she studied hard, even learning English and French because of her love for languages. This was her life until she turned fifteen, when everything changed forever.